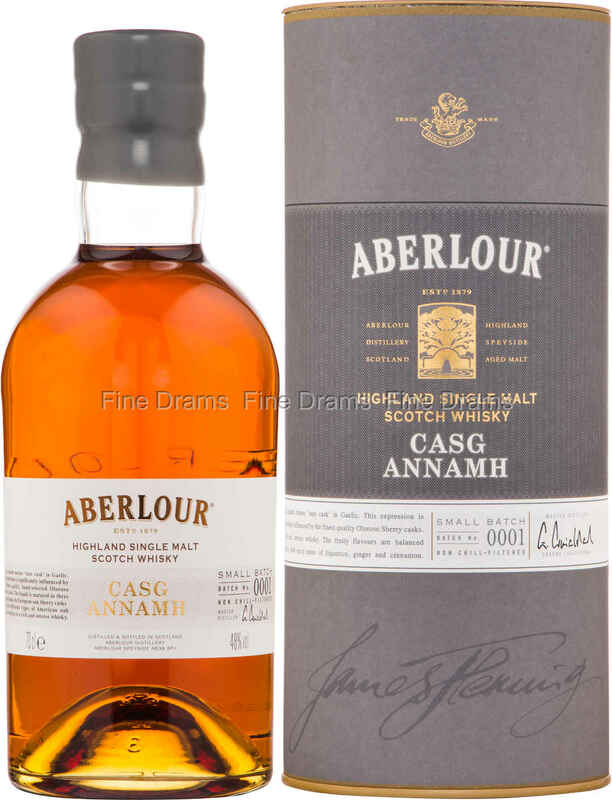 An exciting new release from Aberlour! This bottling was first aimed at the French market but has now been opened up to whisky-lovers around the world. Seen as a sister bottling to the fan-favourite, A'Bunadh series, Casg Annmah translates from the Gaelic as “rare cask”, referring to the three cask varieties used to make this sumptuous malt whisky. The whisky is matured in a mixture of Oloroso sherry casks, and two different kinds of American oak cask. This is a small batch production. Drinkers can expect bold flavours of dried fruits, cinnamon, nutmeg, some stone fruit, milk chocolate and warm malt. Casg Annmah is bottled at the higher strength of 48% ABV, and without chill filtration, enhancing the mouthfeel and flavours of this dram. If this whisky turns out to be anything like as popular as the A’Bunadh line, then the Batch 1 may prove a worthwhile investment for collectors. Either way, this is a delicious dram packed with plenty of that youthful, sherried Aberlour character.